Here is a basic granola recipe that is easy to switch up to include the seeds and nuts of your choice. Who knew granola could taste so good? We love it with fruit and yogurt for breakfast or even as a salad topper. I'll be sharing our favorite granola cookie recipe here next week. Preheat oven to 325° F (300°F for convection oven). In a large bowl, mix together the oats, nuts and seeds. Combine the oil, honey, brown sugar (or maple syrup) and spices in a small saucepan. Bring to a simmer over low heat. Remove from heat and add vanilla extract. Add the wet ingredients to the dry ingredients and mix thoroughly so that everything is moistened. Spread on two ungreased large rimmed baking sheet and bake for 30 minutes or until golden, stirring every 10 minutes. Let cool. 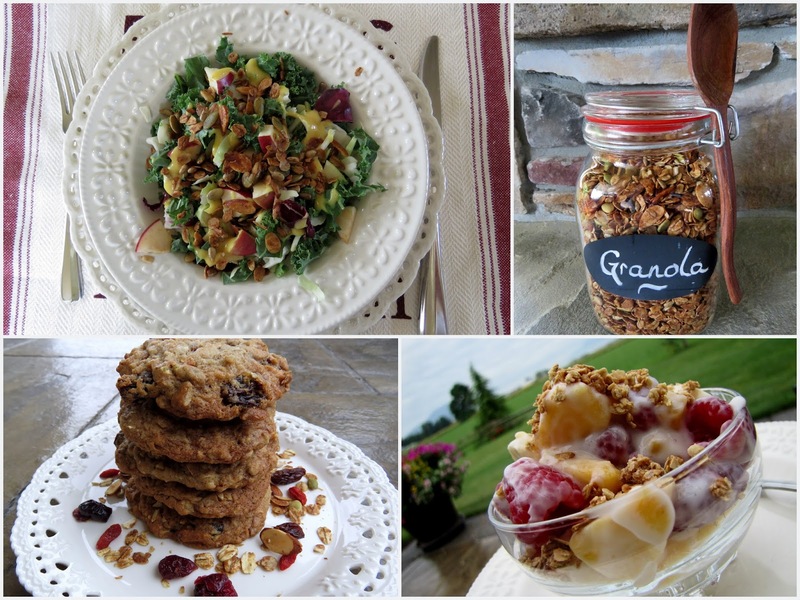 Store granola in an airtight container at room temperature for up to several weeks....or store in freezer. Salad topping (great on kale salad or any salad with fruit). Eat it with various fruits, nuts and seeds as add-ins. (i.e. raisins, craisins, cashews, dried apricots, dried apples, dried cherries). Makes a great neighbor gift. Pour granola in cellophane bag and tie with ribbon...or fill a glass jar. Add to cookies along with dried fruits. Your recipe is very similar to one I have been making and enjoying. However, yours has less oil and sweeteners. So I have just edited my recipe and have a pan in the oven as I type. Love the smell. Also love your serving suggestions. Great ideas! I've been making granola for years and years. We add molasses to ours, just one more way to give us extra iron! Oh, and I've been known to eat it with just a bit of milk on it for breakfast too. I've been looking for a good granola recipe; this one looks like a good start and thanks! Hmmmm...John will love it on his yogurt.